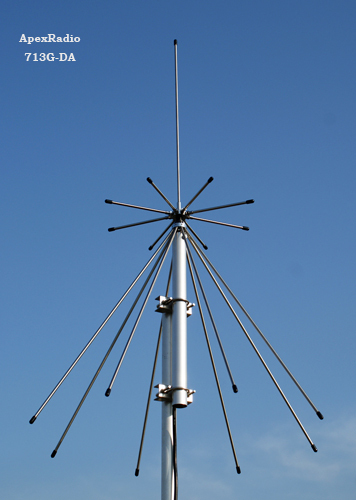 The ApexRadio 713G-DA antenna is designed to receive across the frequency range of 70MHz to 3000MHz (3GHz) employing a regular discone configuration. The small size and relatively light weight design is ideal for installation in a confined space such as an apartment balcony. This antenna employs a low-loss N connector. It is only 1.04 m (41 inch) tall and weighs 1.1 kg. (2.43 Lbs). It comes with a preassembled 10 m (30 feet) length of cable with a N plug to connect to the antenna base and a BNC plug for your radio receiver. Click here to view 713G-DA Instruction Sheet [PDF 1180K].